The Diary of River Song was almost destined to be a success for Big Finish, taking one of the most intriguing characters the modern series of Doctor Who has introduced and further refining her sometimes larger-than-life persona in a series of both intimate and bombastic adventures that has forced her to confront the very complicated nature of her existence and her incredibly strong sense of self. 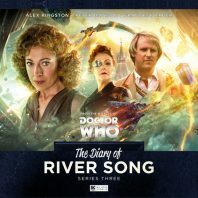 Having crossed paths with the Sixth, Seventh, and Eighth incarnations of her one-time husband previously, the third series once more finds River navigating the web of time as only she can, this time as she finds her Doctor’s own past squarely coming into conflict with her own. Nev Fountain opens the third series with ‘The Lady in the Lake’ on Terminus Prime where clients can choose their own means of demise to suit their final desires. When River Song arrives and finds that there are repeat customers here when downloading unused club card points, however, it’s clear that something much more sinister is going on, and that mystery goes right back to Demon’s Run itself. Through the introduction of Lake is presented the very compelling and powerful idea that the Doctor’s actions are presented as heroic and good only through the filter of his eyes and moral code. To many survivors of the events of Demon’s Run and assuredly other encounters, the Doctor truly is a force for evil who brings loss of faith and loss of life in his wake, and that unique dichotomy of presumed morality stemming from individual perspective is a fantastic central concept for River to explore, especially given how truly integral that location is to her very being. As River cavorts with Death as only she can, the truth behind the Great Lake cult ties in with the revelation that River was not the sole experiment of Madame Kovarian, and that seven others shared her inexorable fate. For all of the discussions that centre about this rather morbid topic, the suggestion that the possibility of continued life thanks to regeneration could drive one with mad with the uncertainty of what to expect is a fascinating topic that unfortunately seems all too human with its flawed basis. Lake positioned himself as a spiritual leader of his trapped group after regenerating without knowledge of the process, treating death as homeopathy and instilling the belief that rebirth and ascension are possible, thus resulting in one members’ obsession with dying that is brought to life all too chillingly. Superseding this is the gruesome topic of Lake’s experiments to pin down his own eventual fate, putting in motion a truly disturbing and inexcusable course of action affecting all of his comrades which Leighton Pugh plays exceedingly effectively. Given the brief running time of this single story, Fountain is able to make all of the characters and their motivations come to life as well-defined entities through action and narration, and the fate of Sophia Carr-Gomm’s kind-hearted but naïve Lily becomes all the more poignant given the heartbreaking avenue to closure that she represents for River. Despite its dark psychological subject matter, ‘The Lady in the Lake’ still displays plenty of River’s usual charm and wit, and Alex Kingston ably shows an immense range that runs the full spectrum of emotions as she holds a mirror to herself while her past stares her down directly. As River comes upon the Fifth Doctor and his companion, Brooke, it’s clear that pasts of all sorts will be haunting River throughout this set. ‘A Requiem for the Doctor’ brings the Fifth Doctor, River, and Brooke to eighteenth-century Vienna to explore changes to the timeline circling around Mozart and his final work. Whether one takes the view that death follows the Doctor or that the Doctor follows death, Jacqueline Rayner bravely takes time to slow events down both at the dinner table and elsewhere to showcase the dynamic currently aboard the TARDIS even as inexplicable deaths begin to mount around them. Perhaps unsurprisingly, Brooke is becoming jealous of River who has just joined them and who is seemingly able to make the same leaps in logic as the Doctor while being unafraid of throwing herself into danger. Because this is the first introduction to Brooke, the audience does have to make some assumptions based on the softer and more emotional voice that Joanna Horton uses for her very modern and open Brooke, meaning that the weight of her valid concerns are somewhat nebulous without seeing this group in action elsewhere. Nonetheless, the three leads do have an appealing chemistry together, and the more intimate scene where the Doctor assures Brooke that she is doing well and will continue to make great strides is a definite standout as both begin to suspect that River may know more than she is letting on at this time. Having poison as the murder weapon is a natural choice given the lack of any other physical evidence, and although Rayner doesn’t really try to hide who Mozart’s murderer is in this scenario, the burden of proof given the nature of the death still presents with it good drama that soon cascades into the streets of Vienna itself as the hunt for the being at the source of the murders continues. This is very much a female-driven script, and Rayner writes the four leads of River, Brooke, Antoinette, and Giulia exceedingly well with all of their positive attributes, flaws, and reasons for their motivations on proud display to create complex and layered individuals. This layering dovetails with the alien nature of the poison’s effects nicely which implicitly begs the question of just how far one would go to receive praise and adoration when hatred is at the very foundation of the acts that person inspired. The resolution that focuses on the eventual unanticipated ramifications of said actions is a very intimate one that the sound design helps bring to life wonderfully, and the notion of the poison’s essence escaping into music itself provides a neat means by which the Doctor can get history and Mozart’s legacy back on the right track as known today. Although- and this is an individual sentiment that others will not share- ‘A Requiem for the Doctor’ does sometimes suffer from strange moments briefly tread into flits of caricature and that bring an odd sort of levity to the deathly situation, the burgeoning relationship between the new TARDIS trio that culminates in a great cliffhanger ending unquestionably takes the starring role and anchors the strange events in a more grounded interpersonal drama that should continue to feature prominently. John Dorney picks up the narrative with ‘My Dinner with Andrew’ at the Bumptious Gastropod, the most exclusive dining experience outside the confines of spacetime itself where rules of causality do not apply and literally anything can occur. ‘The Lady in the Lake’ toyed with the idea of River choosing a non-linear passage through time, but ‘My Dinner with Andrew’ takes the quick-thinking and temporal elements that the character bring with her and maximises them to their fullest extent in one of the most comedic and narratively ambitious scripts Big Finish has released. Knowing all too well the intricacy and importance of the web of time, the reservations for and appearances of both the Fifth Doctor and Madame Kovarian in short order present a nightmare scenario that tests River’s resolve to its fullest. With the resulting action being delivered akin to the courses of a meal, the cascading series of temporal backtrackings and overlappings is kept from ever becoming too confusing or dark thanks to the steadying presence and moral conscience of Jonathan Coote’s eccentric Maitre D’ as River’s plan to save her future husband becomes ever more desperate. River’s hallucinogenic lipstick affords her the time needed to form the inkling of a plan, and Brooke’s resultant meeting with Madame Kovarian in which she says she killed the Doctor as ordered because River told her so is played brilliantly by both Frances Barber and Joanna Horton. Indeed, this is a story in which the performances are uniformly excellent, and Alex Kingston sparkles as River’s enduring love for the Doctor drives her refusal to ever stop trying to keep him safe. At the same time, ‘My Dinner with Andrew’ presents the unique opportunity for Peter Davison to go completely off character, twice able to drop the Fifth Doctor’s persona as he plays both an English gentleman and robotic servitor who bear the same face as the unknowingly beleaguered Doctor who are then sent in his stead to face Madame Kovarian. Davison goes hilariously over the top with the more violent vocal stylings of the robot, but it’s the gentleman Andrew that allows Davison to showcase his strength as the everyman as Andrew unknowingly puts his life at stake with manners and appetite intact. With River forcing Andrew to join her and put on the Doctor’s clothes before heading out to his fateful date, the question is logically raised of just how far River is willing to go to achieve her goal and if the life of any one human is truly any less significant than the Doctor’s. Fittingly, morality does get the best of her, and the resultant circle she closes by ensuring Andrew’s safety from the attack she initiates is a grand conclusion to the emotional and unrelenting rollercoaster ride that River’s outlandish but apparently failed protective scheme entails. Matt Fitton closes out the set with ‘The Furies’ as River chases down Madame Kovarian to quite literally confront her past as she tries to come to terms with the Doctor’s passing. Frances Barber made an immediate impact as Kovarian in series six of modern Doctor Who, but the necessary progression of River’s storyline meant that an incredible amount of Kovarian’s story was left untold. Here, Fitton suggests that Kovarian has continued on with her mission to kill the Doctor after losing River to love for the Doctor and being forsaken by the Church and even its more radical members, swelling the numbers within her ranks and going earlier into the Doctor’s own timeline with her attempts. The return of River allows Barber to show a subtly more matronly side of her character as she tries to win River back to her side, but it also allows a terrifying glimpse into River’s childhood and serves as a stark and brutal reminder of just how much River was deprived of by not knowing Amy and Rory during her crucial developmental period. Her first words mirrored the basis of the mission for which she was being groomed and she was adept with weaponry before she could walk, and- together with the nightmare room and tales of the spirit-like Furies who hound guilty souls to death- these paint a rather despondent picture of River’s unloved upbringing and suggest just why the dynamic presence of the Doctor would be so alluring to her. Surprisingly, ‘The Furies’ ends up being a more intimate affair than most series finales, and River interacting with her version 2.0 replacements offers great insight into Kovarian’s continuing scheme and how much of a hold she has over the minds of the young women she is more affectionately grooming to complete her task. Naturally, these women are strong-willed and capable in their own right, and differences of opinion naturally lead to superb bouts of personal and interpersonal conflict to humanize this group of would-be murderers, but Francesca Zoutewelle as H-One and H-Two, Nina Toussaint-White as the second Brooke, and Pippa Bennett-Warner as O are each able to bring an amiable but inherently competitive and dangerous edge to their ranged performances that allows a natural openness and receptiveness to River’s words as the present confronting them and the past they experienced intersect less than seamlessly. With the comparative lack of action compared to dialogue, the performances needed to be exceptional to carry the release, and everyone involved rises to the occasion with a natural outpouring of emotions, culminating in one of the most heartbreaking moments a Big Finish set has ever ended on- regardless of the positive outcome for the Doctor after being seen to die earlier- that perfectly encapsulates the familiarity and unfamiliarity of the situation in which River finds herself. The Diary of River Song continues to bring the modern and classic eras of Doctor Who together expertly, and the focus on the emotional toll River must endure to save a man who must not yet know her identity and her eventual importance to him is handled spectacularly throughout this third series. Although the Fifth Doctor is by necessity somewhat sidelined following the outing in Vienna and the relationship between River and he remains somewhat unexplored despite the easy chemistry shown during their brief time together, this is another superb outing for both Alex Kingston and director Ken Bentley that features some genuinely classic ideas, a bevy of emotional moments, and a flare for non-linear and unexpected storytelling methods that will assuredly endure in the mythology surrounding this beloved character well beyond the final closing theme song.